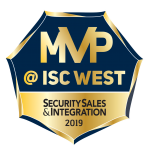 LAS VEGAS, NV – April 9, 2019 – Razberi Technologies was selected for Security Sales & Integration’s (SSI) Most Valuable Product (MVP) Award for Video Surveillance at ISC West 2019. 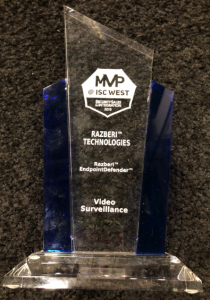 SSI named Razberi Technologies’ EndpointDefender™ as a MVP in the video surveillance category. This is Razberi’s third consecutive year to receive the MVP designation. SSI honored Razberi Technologies for their accomplishment during an evening ceremony at The Venetian Hotel, Las Vegas. Nearly 130 entries were judged independently by a panel of industry experts. Winners of this award receive exposure in SSI’s magazine, website, and electronic communications. “Now in its fifth year, SSI’s Most Valuable Products Awards has solidified its standing as not only one of the most credible programs of its kind for the electronic security industry but also the greatest value for entrants,” says Security Sales & Integration Editor-in-Chief/Associate Publisher Scott Goldfine. All 47 entries were judged by a panel of experienced integrators and industry consultants. In addition to being recognized at ISC West 2019, winners’ products will be featured in the June issue of SSI, highlighted “callout” in the SecuritySales.com Product Awards section, social media coverage, and an earmarked newsletter article.